Imposing higher tariffs on steel imports to curb trade deficit appears to be a good move on paper, but given that imports of the alloy were already on the decline, was the move required. Unfortunately, exports are declining too, which means India still remains a net importer of steel. 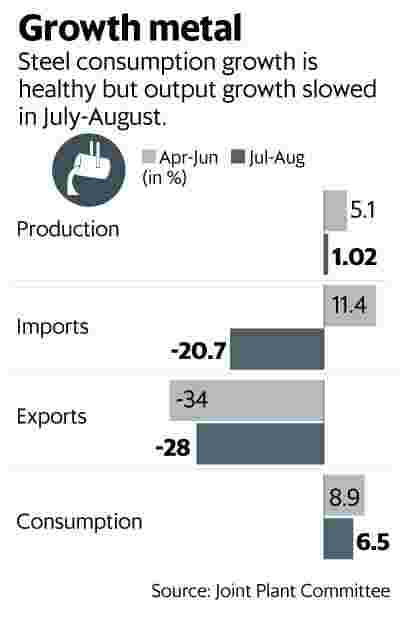 A better plan may be to boost exports, so that the trade balance improves and the steel sector’s health looks up as well. That said, if the government does impose higher duties on steel it will be good news for domestic companies, as they will get headroom to increase prices. Domestic finished steel demand growth remained healthy in July-August, increasing 6.5% over the year-ago period, according to Joint Plant Committee data. However, given that steel output grew by just about 1%, the market was tightly supplied even as imports fell. Exports also declined considerably, as the industry appeared to be keen on the domestic market. While steel prices have remained firm, the depreciation in the rupee versus the US dollar would have given domestic companies the edge. The slowdown in steel output is somewhat of a concern, though the private sector has done relatively better. As India’s steel demand grows at a steady rate, domestic output has to keep pace with it. Then the export surplus steel needs to improve utilization rates across the industry. If the trend seen in July-August continues in September, domestic sales should contribute to a higher share of the sales mix. A slowdown in output should signal slower volume sales growth, too, with profitability being influenced by price increases and product mix. Rise in interest rates, and higher raw material and fuel costs will also impact the performance of steel companies as working capital requirements increase. Eyes will also be on the import of cheap Chinese steel and whether Beijing plans to ramp-up production. On Wednesday, Reuters reported that Chinese state planner National Development and Reform Commission announced an increase in infrastructure activity and accelerated execution of approved projects. This came a day after the US imposed tariffs on another $200 billion worth of Chinese imports. The move may have been designed to assuage concerns that higher tariffs could slow down the economy, but consequently steel prices got a boost as the market saw the announcement as a sign of demand growing at a healthy rate. However, concerns over pollution levels by the Chinese steel industry remain, and winter season capacity cuts are likely to be announced soon. Therefore, Indian steel companies appear to be in a comfortable position. A recent note from rating agency India Ratings and Research Ltd said it expects steel companies’ balance sheets to look healthier by the end of FY19, with sustained profit margins. However, a few large mills could see their debts increase due to acquisitions and capex. On domestic prices, rating agency Icra Ltd noted that a seasonal cut in hot rolled coil prices in August led to domestic steel trading at a discount to imported steel. But a weaker rupee should boost domestic competitiveness and prices. Given that domestic steel companies announced price increases in September, it should reflect in higher margins in the December quarter.